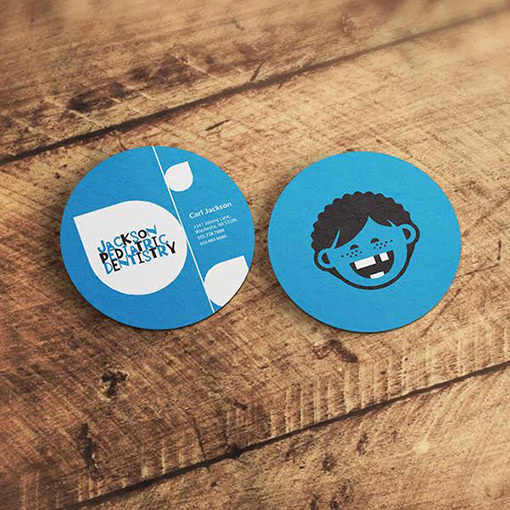 A custom die-cut makes a fun, playful business card for a pediatric dental office. The card's circular shape helps to make it more memorable and welcoming than a standard, sharp-cornered design. Its blue background relies on the cool color's soothing properties to help calm nervous patients, and white accents remind recipients of pearly white teeth. A cute cartoon illustration on one side of the card contributes to the kid-friendly feel. The business card's PMS printing shows just how creative and entertaining a design can be when it uses these pre-mixed inks.